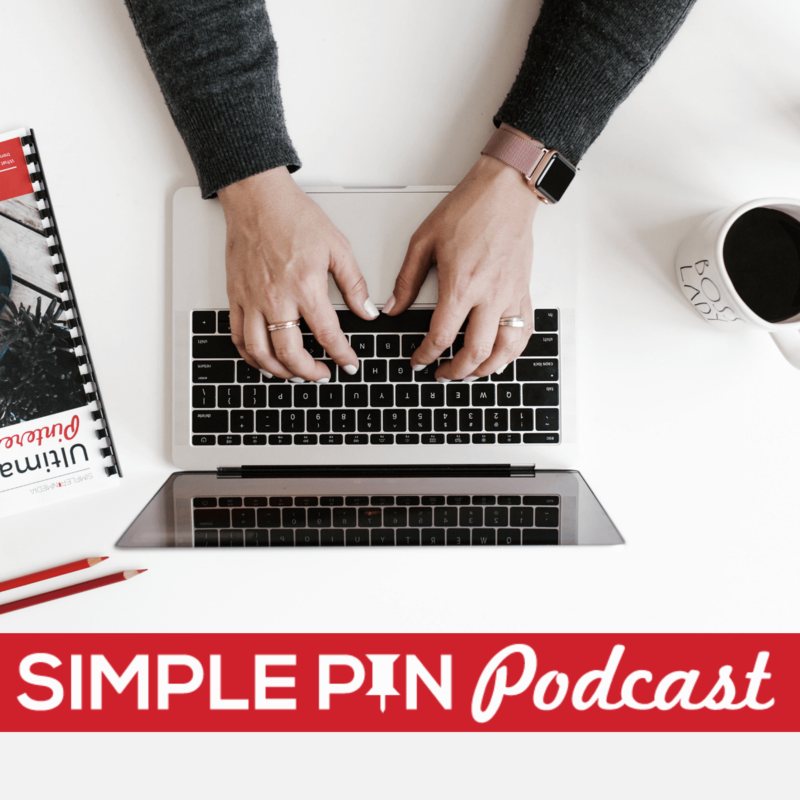 Today we’re going to discuss why you should automate your Pinterest marketing. Everyone wants to be more efficient with their Pinterest marketing so that they have more time for content creation. I brought on Amanda, my former assistant here at SPM, who created the How To Master Tailwind course and another new course we will talk about a little later. Amanda is a lifestyle blogger, who mainly focuses on DIY home decor. She grows her site, A Crafted Passion, while staying at home with her two little girls. Amanda is high follow-through on the Kolbe test, just like me. Automation is a time saver and for a perfectionist like Amanda. Automating her Pinterest has not only been a huge time saver but also a mental relief, because she knows she has a good system in place. If you’ve never run a time audit on your week, give it a try. You’ll see exactly how much time automating your Pinterest could save you. Jessica Turner’s book, “Stretched Too Thin,” is what first introduced me to the idea of time auditing. When I first completed a time audit, I realized that I had plenty of time to get everything done. I just wasn’t utilizing my time well. Amanda used RescueTime to help her know exactly where she was spending all of her time and how she could change that to help grow her business. You put so much time and effort into creating our content and products. You can’t just sit around and hope other people come along and pin it for us. YOU have to make sure you’re getting your content out there. Whether your goals are sales, leads, or clients, you need to ensure that your site is getting traffic. Inconsistent pinning – not only does Pinterest not like it, but you’re not able to tell what is working and what isn’t. You have to be strategic with Pinterest marketing in order to see the results. Pinterest wants you to be an active daily contributor on the platform. Don’t get hung up on on a specific number of pins to share. Just focus on sharing your content consistently platform. Make sure you’re looking at your Google Analytics to find out which of your posts are getting the most traffic so that you can be utilizing those posts well. Focus more on your own content than on the posts of other people. Keep in mind that you can’t totally forget about your Pinterest, even if it is automated. You have to be looking at your analytics to stay updated on what is happening with your site. You can’t take a “set it and forget it” type of mentality. If you do that, over time your traffic will decline. When you set up your automation and forget it, you’re not taking the seasonality of Pinterest into account. You have to be thinking and pinning about an event 45 days before it takes place. If you are pinning about Valentine’s Day in October, Pinterest isn’t going to be showing you in the smart feed because your pins aren’t relevant to what is being searched for at the time. We know that automating your Pinterest marketing is important to many of you who are trying to grow your business. Tailwind has created a new featured called SmartLoop to help Pinterest marketers take advantage of automation. Amanda has been using it for about a year and a half and she loves it. SmartLoop allows you to save even more time and be even more strategic. Amanda is spending about an hour a week on Pinterest. SmartLoop makes it easy for you to reshare your best pins at the best time for maximum engagement. Best of all, this is a Pinterest-approved tool! We’ve had so many people asking questions about SmartLoop, we decided that we had to create a course. You know that it’s very important to me to have simple courses with easy, actionable tips. Because SmartLoop overwhelms me, and I know it doesn’t overwhelm Amanda, I asked her to create a course on it. The Tailwind SmartLoop Simplified course includes everything from the initial set up, to regular maintenance, to advanced loop options (and it’s Tailwind-approved!). The layout of the course is very similar to our How to Master Tailwind course. It contains 11 step-by-step lessons with videos that walk you through the ongoing strategy of automating your account. The course also includes a workbook (Amanda loves a good workbook.) The course includes a dashboard that facilitates viewing your Google Analytics stats (if you’re not familiar with Google Analytics). We’ve made it all as simple as possible. If you have SmartLoop and have been playing around with it but haven’t quite figured it out, this course would be perfect for you. Is the Tailwind SmartLoop Simplified Course for you? Yes! Tailwind SmartLoop Simplified is perfect for any business owner who is wanting to pin consistently, save time, and streamline their Pinterest strategy. If you feel like you have a solid strategy and aren’t having to cut things off your to-do list, then you may not need this. But if you feel at all overwhelmed OR you just love Tailwind, this is definitely for you. Tailwind SmartLoop Simplified is perfect for everyone who doesn’t have a Pinterest manager and really wants to get efficient with Pinterest marketing. It’s not really necessary for those of you who already have hired Pinterest management companies, since we are constantly looking at your Google Analytics and pinning consistently for you. The course launches today! Today (January 30th, 2019) through February 5, 2019, we are hosting a special promotion and special bundle options. You should first complete the How to Master Tailwind course if you haven’t already. That will really walk you through setting up your boards, analytics, and batch pinning. Amanda refers back to those lessons in the SmartLoop Simplified course. It’s so important to us here at SPM that you are using your Pinterest marketing with a greater purpose. We want you to be getting leads and more buyers on your email lists. Pinterest marketing can grow your business if you are using it well. We hope you check out Tailwind SmartLoop Simplified and that it answers all the questions you have! 26:36 – Is SmartLoop for Me?